Have you ever wondered what it takes to be a world leader? What did the men and women who run our countries study to land such powerful positions? We went through every country to find out, and the results might surprise you. As it turns out, 83% of the heads of government undertook some sort of post-secondary education. 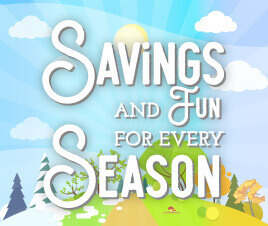 Masters and doctorate degrees abound in fields from law and engineering to architecture and economics. Some leaders – many of whom come from royal or military families – opted to forego formal higher education in favor of rising through the military ranks. Others, it seems, simply studied what interested them at the time. 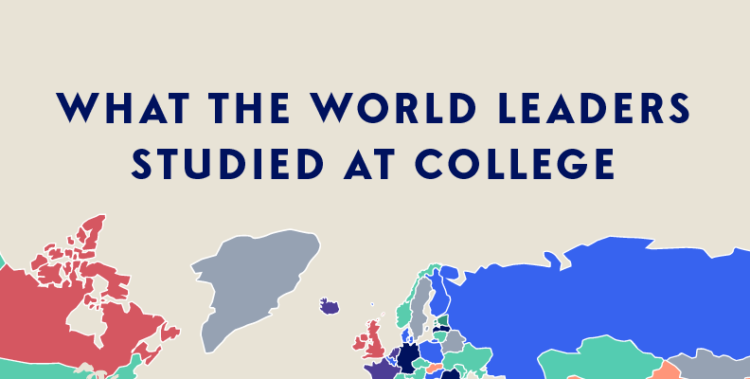 Hover over our interactive maps below to see the name of each country’s leader and their field of study. 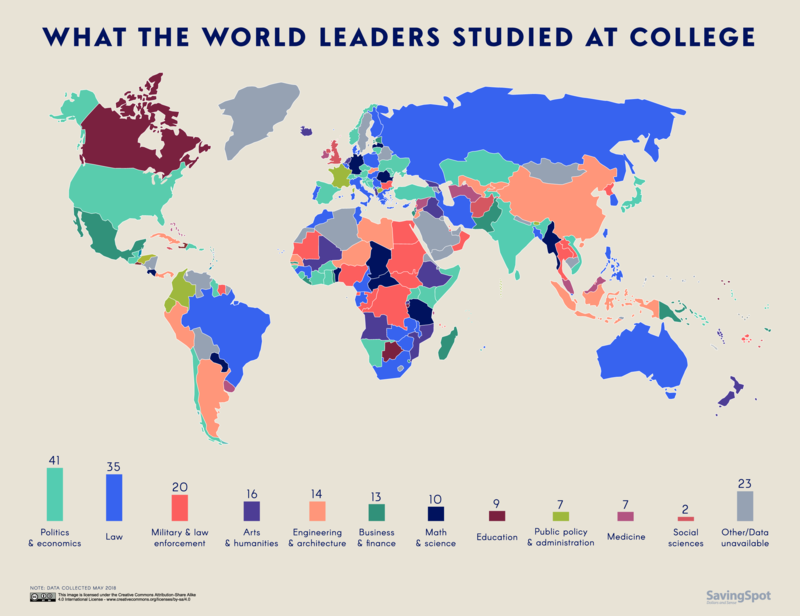 Of North America’s 24 leaders, a whopping 13 hold master’s or doctorate degrees. But that’s where the commonalities end. Fields of study range from medicine (Bahamian Prime Minister Hubert Minnis) and development science (Andrew Holness of Jamaica) to environmental geography (Canada’s Justin Trudeau) and Latin American studies (Costa Rican President Luis Guillermo Solís). Salvador Sanchez Ceren, leader of El Salvador, graduated as a teacher and taught for 10 years before moving to politics, while newly appointed Cuban President Miguel Díaz-Canel holds a bachelor’s in electrical engineering. From Portuguese President Marcelo Rebelo de Sousa’s legal doctorate to the leaders of Belgium, Cyprus, Denmark, Finland and Greece, who all hold a master’s of law, a quarter of Europe’s leaders chose the legal field for their education. The remaining leaders’ backgrounds, though, are as diverse as their country’s cultures. Andorra’s Antoni Marti is a trained architect, German Chancellor Angela Merkel obtained her doctorate in the field of quantum chemistry and the leader of Sweden? He was a welder before being elected into office. Despite being a diverse continent, many African leaders tend to share similar educational backgrounds. As might be expected, some of the countries with strong military representation – Democratic Republic of the Congo, Sudan and Egypt – all have leaders with past military experience. But that doesn’t mean there aren’t some notable outliers. Gambian leader Adama Barrow holds a real estate diploma, while Zanzibar President Ali Mohamed Shein earned a PhD in clinical biochemistry and metabolic medicine. Naturally, we’d expect to find the most active people in Burundi, where leader Pierre Nkurunziza holds a bachelor’s degree in physical education. Just like the size of its land mass, the range of educational background among Asia’s most powerful leaders is huge. It comes in third place for the highest number of law degrees, held by leaders including Rodrigo Duterte of the Philippines and Russian President Vladimir Putin. To little surprise, North Korean leader Kim Jong-un comes from a highly militaristic background, as do his counterparts in Laos, Qatar and Thailand. More unique study choices include zoological engineering (Sooronbai Jeenbekov of Kyrgyzstan) and chemical engineering (Xi Jinping of China). From Australian leader Malcolm Turnbull’s law degree to leader of Vanuatu Tallis Obed Moses’s theology diploma, government leaders in Oceania come from a range of educational backgrounds. Both Peter O’Neill (Papua New Guinea) and Tuila’epa Sailele Malielegaoi (Samoa) hold degrees in commerce, while Fijian president, retired major general Jioji Konrote, had a long and distinguished career in his country’s military. And though they come from the islands, we’re willing to bet that school was no paradise for Hilda Heine (Marshall Islands) and Rick Houenipwela (Solomon Islands). They hold doctorate degrees in education and political science, respectively. With only 13 leaders on the continent, it might come as a surprise that two of them – Venezuela’s Nicolas Maduro and Bolivia’s Evo Morales – opted not to pursue their education beyond high school. Those who did, however, clearly have varied interests. Chilean President Sebastian Pinera holds a doctorate in economics, while the Ecuadorian and Colombian leaders both studied public administration. Paraguayan president Horacio Cartes has a post-graduate degree in aviation – perhaps inspired by his father’s Cessna franchise – but instead chose politics as his career path. Though there’s clearly no ‘right’ path to the top job, understanding these leaders’ educational backgrounds might offer us a bit of insight into how they run their countries – and keep hope alive that one day you might be able to score the position for yourself.